Haiti kept Mission of T.E.A.R.S. and our partners in Haiti very busy in 2014. Planning to ship a forty foot container began in late 2013 along with planning for groups to travel. Space limits the ability to present all those events but here are a few highlights captured in pictures presented below. Container that was shipped to Haiti in 2014 and being unloaded on arrival. Rev. Lewis shares in the anniversary of this local church 50th year milestone of ministry in Haiti. Repairs underway to the church badly damaged in the earthquake in 2010. This church was rebuilt over the last several years after being totally destroyed in the 2010 earthquake. The younger children in a make shift school room. The school was attached to the church. Mission of T.E.A.R.S. organized and hosted an interactive leadership seminar held in Port au Prince introducing our NGO partners in Haiti to one another and to our Canadian church friends. Diane explains to the group who traveled with her to Haiti about the vocational garment making program and training set up by Mission of T.E.A.R.S. and our Haitian partner at this sight. Diane standing in front of a building leased by Mission of T.E.A.R.S to provide a start to a girls shelter and training program in Haiti post quake. It was intended to house older girls who had lost families and were orphaned after the quake. The home was run in agreement with 'His Home'. Dr. Brian Nickles from Peterborough Ont. and Play Therapist Sandra Web from Cobourg Ont. who traveled with Mission of T.E.A.R.S to asses the effects of post trauma effects on the girls who survived the quake. 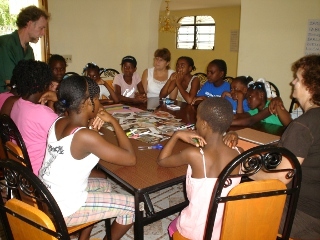 They are shown having the girls complete some simple assessment tasks. Mission of T.E.A.R.S provides opportunities for persons traveling overseas to use their talents and professional skills like Jackie who is seen here with the resident doctor at a clinic in Haiti.